Have You Got A Light? Mostly, when I am researching a new subject, it is the similarities between religions, which are separated by miles and years measured in the thousands, that leap out. In the last two days however, it is the extraordinarily wide array of variations that is striking. One might think that the creation of the sun would be an event of sufficient significance to rank alongside the existence of primordial chaos as a pretty much constant component of the worlds disparate creation stories. Likewise one would probably imagine the status of any solar deity to be high enough to make them one of the best cards to hold in a game of Divine Top Trumps. By this point I expect the regular reader will have worked out that in both cases one would be wrong. In Ancient Egypt it was Ra, the sun himself, who first rose out of the void and made all the other stuff, but he is far from typical. On the other side of the Sahara, in south west Nigeria, we find the Yoruba mythology. Here Oloron, the chief sky god of a quite large and established pantheon, sends Obatala down from heaven to the marshes on a golden chain. After Obatala has made land in the waters, built himself a home, planted the palm nut that he brought with him and moved in with his cat, it occurs to him that it is a bit grey and dull so he asks Oloron for some light. In answer to this request Oloron knocks up the sun and Obatala is able to get on with the important business of making humanity and palm wine. A little to the east of Egypt, Yahwey has the good sense to invoke some photons at step one, day one, but takes until day four to come up with the source for them. In these and several other instances the celestial lamp is completely devoid of personality or divine spark. Sidling to the north before turning back west gets us to Greece, where chaos brings forth Gaia (Earth), Erebus, (Darkness), Tartarus (an abyss) and Nyx (Night). Nyx has a prodigious number of children including Sleep, Pain, Death and Day. Gaia gives birth to Uranus (Sky) who then becomes her husband and together they begat the numerous Titans including Theia (Brightness). Following her mother’s example for keeping it in the family, Theia marries her brother Hyperion (The High One). It is only at this point, not the fourth day but the fourth generation, that Helios (The Sun) is finally born, and two generations further on he has to give up the post to his grand nephew, Apollo. Turning east again and skipping over most of a continent brings us to the Land of the Rising Sun where Amaterasu (The Great Divinity Illuminating Heaven) is held in high regard, for when she goes away the world is plunged in to darkness and all things die. Despite her exalted position, she is an eighth generation goddess brought in to being by her father wiping water from his eye at the end of a story that has seen him married, widowed and divorced (yes, in that order) by his sister. Along the way they created the earth, oceans, mountains, plants, animals, humans, death and the underworld; presumably by touch. I could go on: the sun is variously the child of night, earth, day, the sky, the moon, the reed marshes, the great void, the realm of fire, or is a lantern carried in to the sky by a woman looking for her lost child. One oddly counter intuitive element that does seem to be consistent is that day and night almost always exist before the sun does. Why would the sun arrive so late in our mythologies? I wonder if, in the mesolithic world of hunter gathering, when the great majority of habitable land was covered by a near continuous forest, anyone really saw the sun that much. Day and night would come and go, but it is only when the neolithic people cut down the trees and started growing crops that the sun became sufficiently obvious and important to get a deity of its own. With the exception that might prove the rule being the desert dwelling Egyptians, for whom an all-seeing, all-powerful, solar creator makes total sense. …here’s to living happily ever after, until the next adventure. Along with many other storytellers I am particularly drawn to mythologies, the sets of stories featuring the deities that shaped the world. The similarities and differences between our most fundamental perceptions of the universe we live in are fascinating. Africa is a big continent. It’s bigger than Europe, India the United States and China put together. Across this vast area of deserts, mountains, jungles, plains, deltas and downlands (any of which make England look like Rutland), a great variety of peoples and cultures have developed, dwindled, fought, traded and flourished. Earlier this year I was given “A treasury of African Folklore” by Harold Courtlander, despite being over 600 pages and the size of a brick this tome barely offers a peek through a gap in the door to the treasure house of tales that the various African nations tell, but what a peek it is! Although only on page 193 I am already onto my third creation. This one comes from the Yoruba people of Western Nigeria. A long time ago earth did not exist. There was sky above and water below. Oloron was the chief “orisha” (spirit, or god. As with the Japanese “Kami” it would appear to be a word that covers both without directly translating as either). Other orisha included Oloron’s children, Eshu, the god of unpredictability; Orunmila, the spirit of divination and the unrelated Obatala, King of the White Cloth (The Yoruban pantheon is conspicuously male, in stark contrast to their neighbours, the Fon people, who’s deities are predominantly couples and androgynes). All these orisha lived in the sky and paid no attention to the only female orisha, Olokun, who ruled over the waters and marshes below… until Obatala looked down and decided it would be a good idea to make some land for things to live on. First he checked with Oloron who agreed it was a fine plan (notably, nobody bothers to consult Olokun which leads to trouble further down the line), then he called on Orunmila who divined what he would need. After a long process of gathering all the gold in heaven from a variety of unspecified orishas the goldsmith eventually makes a chain and Obatala climbs down, pours a snail shell full of sand into the sea, drops a hen on it who spreads it around in an uneven fashion thus creating hills and the like, plants a palm nut and settles down with a black cat. It’s all a bit dark so Obatala requests some light and Oloron, the sky god, makes the sun. Eventually Obatala starts to feel lonely and begins to make people out of clay. The work is tiring and Obatala decides to take a break for some refreshment. He taps the palm trees for their sap, ferments it and quenches his thirst. Now that the world is a little softer Obatala returns to his labour but with drunken fingers he makes a number of misshapen figures, some with short arms, some with too few fingers, some bent or humped and because of his befuddled state he does not notice his mistakes. When they are all done he calls upon Oloron again to breathe life in to them and so the human race came to be. When Obatala sobered up and saw his handiwork he was filled with sorrow. He promised never to touch palm wine again and to take especial care of all those who are lame, formed imperfectly, blind or with no pigment in their skin. It fascinates me how each different culture finds some specific question to answer, like why men and women are different or why death is irreversible, frequently leaving the generation of essential features like the sun with a brief, almost casual, passing reference. I am also struck repeatedly by the acceptance of imperfect gods and how their imperfections explain the world we experience, often far better than if they were all powerful and all knowing. Where, you might ask, did witchcraft come from? How did this magic lark get started? Well, I could answer with talk of tribal shamanism, of ancient herbalists who also practised a little psychological manipulation of simple folk… but that story is a modern construct, a theory advanced by anthropologists and authors of fantasy and, for my taste, has to ferment a little longer before it can officially be recognised as folklore. The story I am going to tell you has been around a bit longer, even if it hasn’t been around as long as it claims. 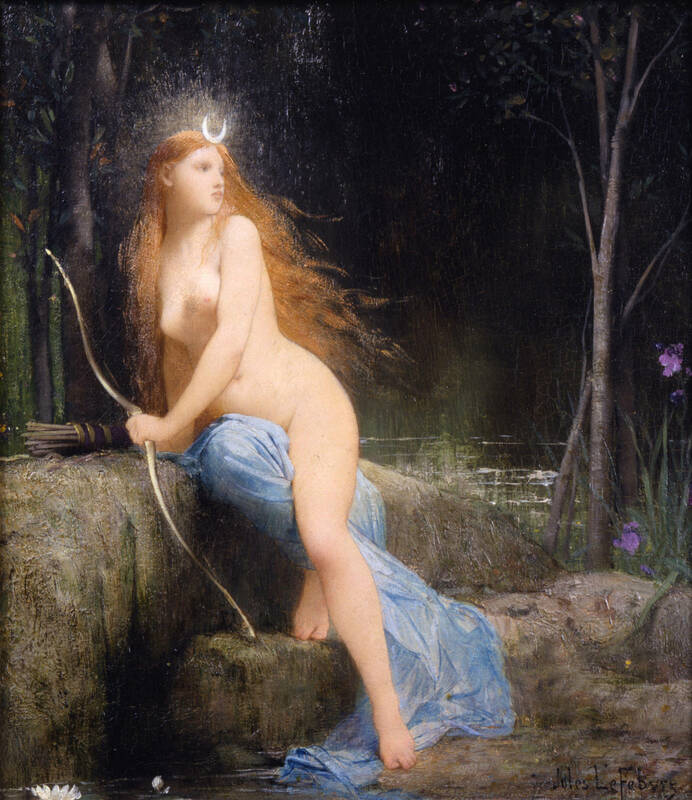 The story starts at the very beginning when the goddess Diana is the first created being. Containing all within herself she splits herself in two, producing from her own darkness the light, simultaneously her son and her brother, who’s name (don’t get carried away now) is Lucifer. Here I have to interject to point out that, although the name means “morning star” and “shining” and “lord of light” depending on your translation, this Lucifer is not the same one that you find in that famous book from the middle east. This radiant fella is from Italy. Treating the one as the other would be like assuming that a chap called Peter from Weatherfield is the same as another bloke called Peter who lives in London when one of them is in Coronation Street and the other in Eastenders. The two mythologies are unconnected. Diana having a rest after creating the earth, trees, water, bows, arrows and cloth, but not apparently clothing. Diana, seeing the beauty of the light wishes to reunite with her other half and chases him but Lucifer is having nothing to do with her. Diana then makes the world and all that goes in it and both she and Lucifer take mortal forms and step down on to the earth. Diana busies herself teaching magic and sorcery to her creations, also bringing fairies, goblins and other supernatural creatures in to being. Lucifer has a pet cat that sleeps on his bed which, unbeknownst to him, is actually a fairy. Diana persuades the fairy to swap likenesses with her and settles on Lucifer’s bed as his cat. In the night she re-takes her own form and seduces the bringer of light. He is not entirely happy with this when he wakes in the morning but she sings to him using her craft and, quite literally, enchants him. For some unknown reason Diana is in disguise as a mortal and none of the witches know she is their creator. She decides to impress them by putting some earth and some mice in an ox bladder (as you do) and inflating it until it bursts at which point the earth inside becomes the heavens, the mice become stars and it rains for a few days. The witches are sufficiently impressed that they take her as their queen. Later, after Diana passed on from the mortal world, the rich people on earth cruelly enslaved and mistreated the poor, so Diana sent the daughter of her union with Lucifer, Aradia, to teach the poor people spells, magic and poison potions to use against the rich. Aradia also taught them about Diana queen of the witches, the cat who ruled the star-mice, the heaven and the rain. Now the story of this story is that it was told by the “stregheria” or Italian witches of Roman times and was passed down an unbroken line in secret. It was first published by an American folklorist called Charles Leland in 1899 who claims it came to him from his Italian assistant Maddelena whilst they were collecting folktales in Italy. She originally wrote it down and gave it to Leland before mysteriously vanishing… It is however entirely possible that one or other of them simply made it up so it may well be a piece of literature and not mythology at all. I expect we will never really know where witches came from, even if they do tell us themselves!